We have been harvesting Rhubarb this week! Here is a delicious way to use it! 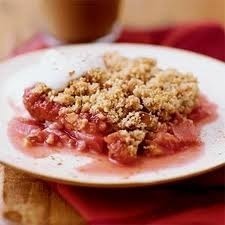 If you like Rhubarb, you'll love this delicious recipe for Rhubarb Crisp! Combine the rhubarb, one cup sugar, egg, 2 tablespoons flour and mace and spread into a deep pie plate. Combine the remaining ingredients to make a crumbly mixture. Cover the rhubarb with this mixture. Bake at 375 F for about a half hour, or until rhubarb is tender.